Just like the charm of the celestial paradise that tends to indulge the spirit in its magical world, the Diva Maldives seems to escape no miracles. Right from the surrounded tropical nature at its best to spa at its summit of healthcare to its blue pleasures waiting in the miles of blue waters, everything seems to be quite hugging and indulging here right from the moment you step in. And the credit for such an ‘out of the world experience’ goes to its remote location just like the paradise, which is far away from the modern hustles. The only difference between this one and the paradise is that this one is luxury over water! Flanked by the nature’s various elements such as hibiscus, frangipani, lagoon’s transparent waters, and the coral dunes; Diva Maldives is a perfectly break off getaway. It is the best beachside retreat on the island for those who wish isolation as well as vacation dreams turning into reality. You really have a lot to see and do: enjoying the lagoon vistas from your own room/suite terrace, cruising on the traditional dhoni, looking for the cute dolphins, leisurely strolling on the tidy white dunes, and snorkeling to meet the whale sharks as well as sting rays. If you are from the lazy gourmets or belong to that category of people who like to be pampered all the time, then also you need not have to complain as there are many restaurants as well as the Infinity Spa with the sunset vistas to ensure that your high spirits of vacationing never subside. So, come and fall in love with its friendly Diva by flying in a sea plane for 30 minutes from Male. 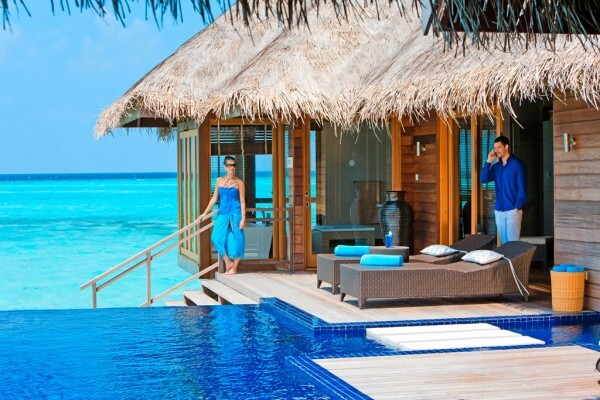 There are 193 rooms including villas at the Diva Maldives all offering the captivating views of the blue sea. A majority of them are fascinatingly on the water or by the beach to credit the genuine luxury that resides in harmony with the nature. 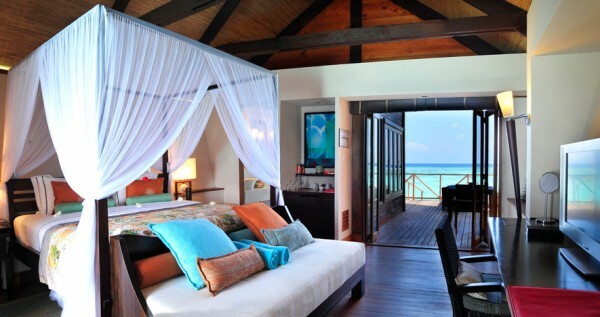 And engulfing the accommodations are the tropical gardens as well as a shining lagoon as the home of marine life. No matter which you choose, all the rooms and villas are adorned with the trendy furniture as well as bright colors and that they all offer access to the lagoon and beach. Among the amenities, you can expect balcony, DVD player, pay movies, AC, separate sitting area, premium bedding, ceiling fan, complimentary newspaper, direct-dial phone, mini bar, wake-up calls, dial-up Internet access, shower/tub combination, hair dryer, private bathroom, turndown service, bathrobes, bathroom scale, free toiletries, daily housekeeping, extra towels/bedding, handheld showerhead, mirror, cable television service, sofa bed, LCD TV, safe, welcome amenities, coffee/tea maker, rollaway bed, complimentary wireless high-speed Internet access, and sewing kit. In no way the six restaurants of Diva Maldives can disappoint you. The Senses restaurant is a perfect place to taste the Indian Ocean, Indian, North African, and Lebanese delicacies, Sri-Lankan or Arabic style teas in the afternoon, and a la carte picks. And yes, here you can also enjoy its terrace seating for soaking yourself into the vistas of the sea as well as the infinity pool. Tucked in the shell shape is the Noo restaurant where you are exactly under the thatched roofs and over the dunes for enjoying a delicious international buffet. This breakfast and dinner serving restaurant also offers live cooking stations, entertainment, and rich themed buffets in the evening. For a Japanese style dining, head to the Pure restaurant where the open cooking brings you to the some most aromatic flavors by the chef amidst the latticework and under the lanterns of silk paper. The East restaurant just over the Malaysian water is dedicated to the Asian land where you are at the ship’s prow to taste the Sri Lankan, Chinese, Indonesian, Thai, Cambodian, and Hong Kong buffets. Missing the Italian pizzas and pastas? Do not worry, the Allgeria restaurant will eradicate that feeling of missing in you. South Ari Atoll, Dhidhoofinolhu, Maldives.